Oh the love of vintage cars...this stamp is one of those that fits the bill when I need a quick masculine card! 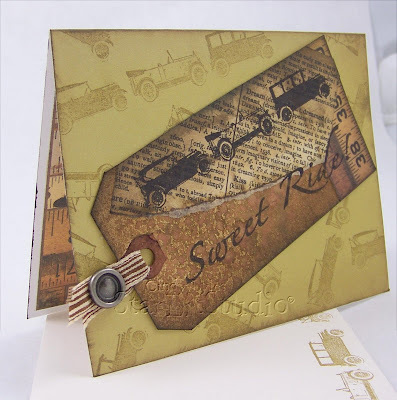 The verse and vintage car images are from B Line Designs. Into a Mini Mister, I placed a dropper full (not just a drop) of Brushed Corduroy Distress reinker, about 1/8 of a teaspoon of Gold Perfect Pearls, and filled the tiny container to about 3/4 full with water. Shook to incorporate the products, and misted this mixture onto a standard office tag. I'm impatient sometimes, so I ironed it flat with a craft iron and did not wait for it to air dry. Distress various torn Tim Holtz and 7gypsies papers and collaged them onto the tag, then stamped cars and sentiment with Archival Ink (Ranger) in Jet Black. Inked edges using a blending tool and a Walnut Stain Distress pad. I used a Pesto Adirondack pad and stamped 3 autos image at random onto a Pea Pod folded card (Memory Box) and blended the edges too. Added striped ribbon and a Making Memories brad that to me, looks like an old tire! :) Inside the card - I spent some time on the inside of this one. Normally my card insides are not this fancy. ;) (sentiments: Penny Black & Stampin' Up!) Thank you for stopping by! I *heart* how you designed this card. Cindy I love your style, you ARE the female incarnation of Tim Holtz you know? AWESOME artwork Cindy! You have an eye for all those details that make this card a beauty! Oh Wow is this an awesome guy card, so love the tag, and what you did on the inside and envelope, some lucky guy to receive this one! Cindy, you ROCK MY WORLD!